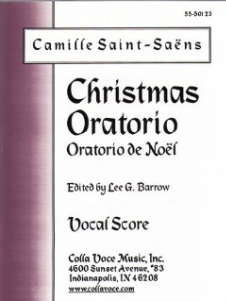 This edition fills the need for a modern, affordable performing edition of one of the most often-performed 19th-century Christmas works. The notation has been modernized and simplified, creating a clean, easy to read score. It includes both the original Latin text and a new, modernized English translation which, unlike the more common version, avoids awkward phrasing and archaic words while remaining much more faithful to the meaning and rhythm of the original text. The availability of a separate choral score makes the work more affordable. For those unable to utilize an orchestra, an adaptation for organ and piano is available. The original instrumentation for the Christmas Oratorio is harp, organ, and strings in the standard five sections. The full score and instrumental parts are available on rental directly from the editor. Intended for use with the Colla Voce/Plymouth Music edition, they are also compatible with most other editions. An alternate accompaniment for Organ, Piano, and optional Harp, created by the editor, is also available. A video performance of this version is available on request. Includes full score and parts for original instrumentation (strings, organ and harp). Strings parts included are 4-4-3-3-2; additional string parts at no charge upon request. Includes separate parts for organ, piano, and optional harp. Rental period is four months; longer periods available upon request. For further information, contact me through the "About/Contact" link at left.